Man…to be fair, I can’t watch this until it’s free on Crunchyroll, so I’m just going off by what I read about the episode. Things are very different than how they’re played out in the novel. I don’t know if you have read the novels of this arc or not, but if you don’t mind me posting a little spoiler or two, I’d like to compare some things about the novel, not that they really would change much here. I can’t really tag them here cause I don’t know how. First off, Kikuoka never took Kirito in the previous episode so directly by approaching his family. He just took him to save him, though I’m unsure whether he had plans for Kirito to continue with the Project. Honestly, in a way, he reminds me of Urahara, always in the background knowing more than anyone else, and certainly not a person to be trusted. Asuna only found out that it was him once she got onto the Ocean Turtle. In the novel, Asuna was very deductive in the situation, as Kirito explained lots of it at the Dicey Cafe in the first episode. 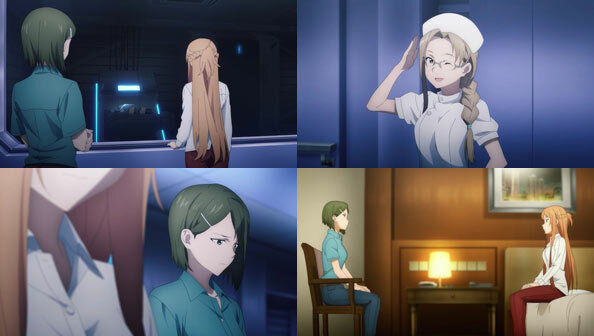 Asuna managed to come to realizations without being told by Kikuoka, including the newborns and why the project needed Kirito and his experience in a Full Dive environment, which is pretty cool of her as a character. Also, she never really told the gang about what happened to Kirito like this in an effort to not make them worry (only Suguha and Sinon); in all honesty, you were pretty spot on about the idea of information leaks. Also, (again, I don’t know if they covered this), she also found out the truth about the FLA; unlike what Kirito said about 3 days, it was 10 years. Big difference. 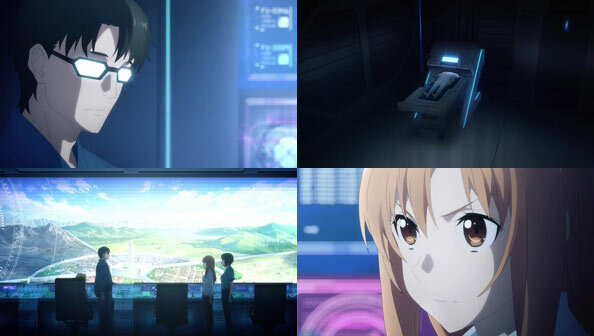 One last spoiler that I wanted to mention here was how she was adamant in the fact that had Kirito knew about his plans, then he would have not helped at all, due to their beliefs in the rights of AI, referencing that incident back in episode 5 of the Aincrad arc. Nice shoutout, but it really shows how Kirito influenced Asuna and changed her beliefs. With this, how does that make you feel about the changes made thus far? Do they make you view certain characters in a different light? I know that making cuts is normal in adaptations, but I wonder if by doing so you’re leaving out some character development, or at least reinforcement of characters that we already know and love. Also, Rinko looks kind of adorable in an apron. I haven’t read any of the source, so there are no ‘changes’ to the story from my particular POV.